Looking for a relaxing and smooth hit at the back of your throat whenever you smoke? Then switch to NICMAXX’s “Smooth” Starter Kit for a velvet sensation you’ll never forget. Are you tired of the usual tobacco flavor from ordinary cigarettes? Or do you want to quit smoking and don’t know how? Don’t worry, quality e-cigarettes are the answer you’ve been looking for and are now available for a smoking experience that’s even better than ordinary cigarettes. There are many types of e-cigarettes available today. Each type has its specialty depending on what type of experience you want to have. If you’re a beginner to the world of e-cigarettes and are looking for a vape to give you that smooth kick, then try NICMAXX’s “Smooth” Starter Kit. This e-cigarette will give you the experience of an ordinary tobacco cigarette without the burn. Chemical intake – Ordinary cigarettes use tobacco. Tobacco is a substance that has proven to be harmful to the human body with a list of thousands of chemicals in the processing of the leaves. Meanwhile, e-cigarettes uses nicotine in its liquid form. Through the vaporization of nicotine, e-cigarettes manage to reduce the number of chemicals going into your body. Save money – As the taxes on tobacco continue to go up, so does the price of the product. Smoking tobaccos is proving to be a costly investment. E-cigarettes, however, are rechargeable and do not have to be replaced right away. Since they don’t require tobacco, the costs are projected to remain more level. Secondhand smoke – Secondhand smoke from tobacco cigarettes is hazardous and inconvenient to the people standing next to you. There are still chemicals in the second-hand smoke coming from e-cigarettes, but it’s drastically reduced, evaporates with the vapor, and has a more a pleasant smell than tobacco. Availability – Different establishments have strict rules against cigarettes. Meanwhile, e-cigarettes are proving to be easier to accept and you can use almost anywhere. Battery – Each of our Starter Kits includes a starter set of batteries. USB Charger - Charge your e-cigarettes from an outlet or your laptop. Two Cartridges – These cartridges contain the nicotine liquid. 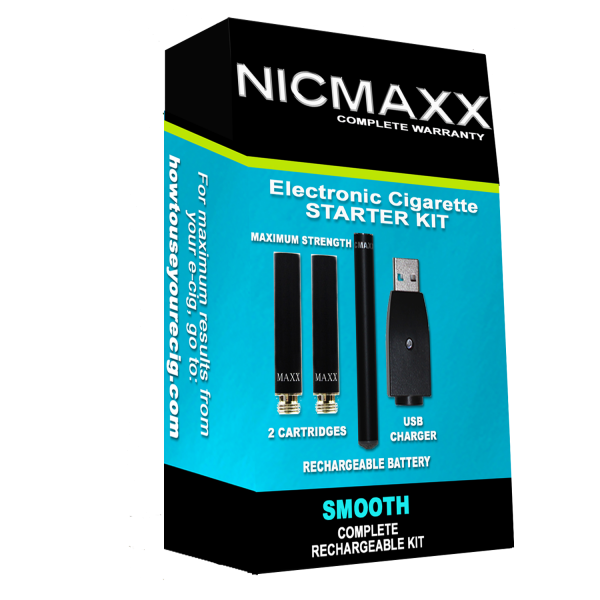 NICMAXX Starter Kits are available in several different flavors. Our “Smooth” Starter Kits promise the smooth smoke that you won’t get from other brands. It’s the closest thing that you can get to the actual cigarette. Thanks to NICMAXX’s countless tests and customer research to give you the best experience. Since 2007, NICMAXX has been providing quality, easy to use electronic cigarettes in the American market. 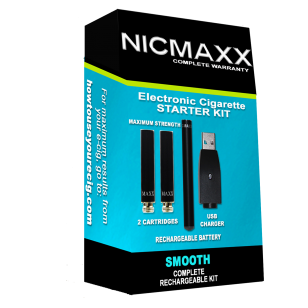 NICMAXX tests to make sure that every part of the e-cigarette kits are safe for use. Through our research, we have found the flavors, spices, and the types of mixtures that you will truly enjoy. Because of this, nine out of ten smokers prefer our superior taste over other brands. NICMAXX is here to make the e-cigarette experience a fun and easy one. Taste the smoothness of NICMAXX’s “Smooth” Starter Kit. We deliver to anywhere in the US. Order now!